WE’RE GIVING AWAY MORE FREE SHIRTS! Right now we’re running a Like and Comment contest on our Facebook page. But there’s another chance to win. Step 1. Hit the like button at the top of this page. Step 2. Like this embedded Instagram post, and tag some friends to enter our IG contest! T-SHIRT GIVEAWAY! Like this post and tag your friends for a chance to win our NATIONAL CHAMPS shirts! Link to buy in our bio! And we can now ship across the country. Make sure you follow us on Instagram and Twitter too! That’s it! We’ll announce the winners soon. HERE’S HOW YOU CAN BUY A SHIRT RIGHT NOW! 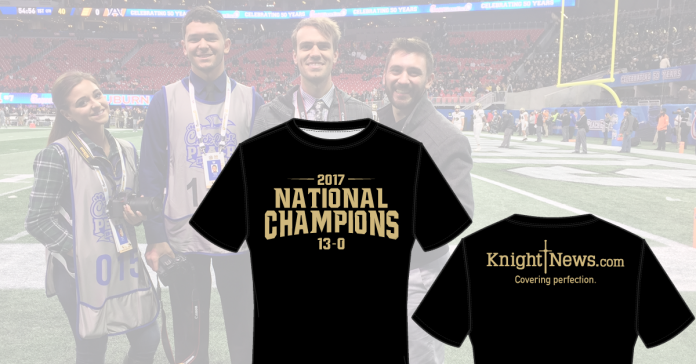 After hearing from alumni and parents who don’t live near UCF, we worked out a shipping option for our special edition Knight News National Championship T-Shirts. Now you can enjoy your shirt and support student journalism from across the country! Pick your size and add to cart. If you want additional sizes, leave the cart window open, continue shopping on this page, and add additional sizes. When you’re done, check out on the PayPal window. You can check out without a PayPal account – and just use a credit card – by following the directions at the bottom of the paypal window. SAVE ON SHIPPING. Choose store pickup and grab your shirt in person from the Plaza on University Leasing Office — once we announce they’re available, likely within a couple weeks! There is also now an option for shipping, available to select once you’re at checkout. This works best when using a computer. If you’re on a mobile device, you may need to visit KnightNews.com from your browser in a new window (rather than clicking from Facebook’s app) to check out properly. Knight News is a 501(c)(3) non-profit corporation that teaches students how to succeed in today’s changing digital media world. A COPY OF THE OFFICIAL REGISTRATION AND FINANCIAL INFORMATION MAY BE OBTAINED FROM THE DIVISION OF CONSUMER SERVICES BY CALLING TOLL-FREE (800-435-7352) WITHIN THE STATE OR AT WWW.FRESHFROMFLORIDA.COM. REGISTRATION DOES NOT IMPLY ENDORSEMENT, APPROVAL, OR RECOMMENDATION BY THE STATE. Thanks for helping get the word out about our contest. It helps us serve students with important UCF news coverage! We appreciate your support. Rules: This contest is sponsored by Knight News, not Facebook, and all entrants must comply with Facebook rules. Winner must be a UCF student/parent/alumni/staff to be eligible to claim the prize.